MaryFran Simply...: Ho Ho Ho...Merry Christmas! Hellooo Out There...I had a lot of fun with the new Majestic Mistletoe from Altenew for this Christmas. This was a bit more labor for a mass produced card than I anticipated, but what the heck, I just went with it. This is an A2 card and I had trouble getting the greens I wanted so this is a combination of greens from different companies. Instead of using a darker green as the layering guide suggested, I embossed with Ranger Princess Gold- a lighter and brighter gold than the standard detailed gold. Once the greens were finished, I stamped the berries on both of the greens because I liked the look. I used Distress Oxide Candied Apple and let that ink dry completely. I used some Prisma red colored pencils for the shadow and then drew in the highlight with a gelly roll pen. Next I die cut the little bow at the top of the mistletoe using the My Favorite Things bow element - Blueprint #26 from some glitter paper and attached it with Ranger Multi-Medium Glue because it dries flat and looks great when it's dry. When done here I adhered a layer of green cardstock between the card base and the front panel. The final panels were either cream colored or red. The sentiment is also from the Altenew set. Thank you for reading this and the materials used and challenges I'm submitting to are below the picture. These cards are beautiful! I love the design and how you took the time to add all of those stunning shades of green. The mistletoe looks so dimensional! 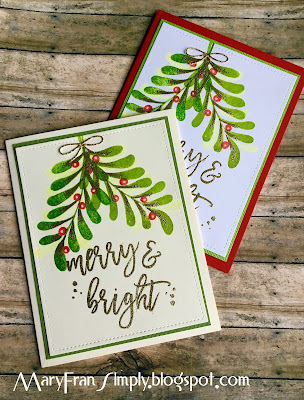 Happy holidays to you and thank you for sharing your talents here with us at the Simon Says Stamp Monday Challenge Blog! Hello Mary, thanks for the comment you left on my blog regarding my PTI card. 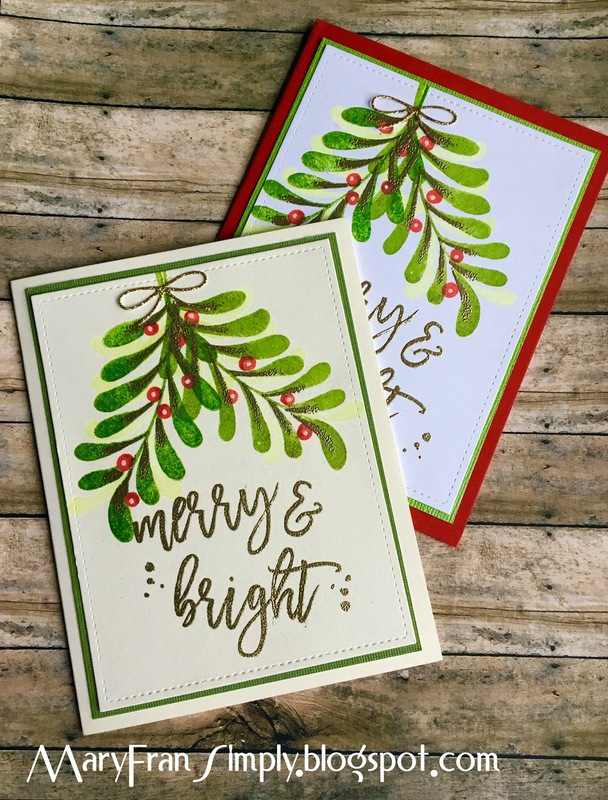 Your Altenew cards are just gorgeous - love the big, bold sentiment! The die on my card is the Center Style Masculine die and it has a matching stamp set. It's very versatile and really doesn't have to be for masculine cards at all! I really must get this one, so thank you very much for getting back to me. BTW, I wanted to mention that I was looking through your cards and you really do have a beautiful eye for design and style!